The Fellowship was fortunate enough to obtain a copy of NEVERBOY #1 from Dark Horse Comics. Shaun Simon writes, Tyler Jenkins draws and Kelly Fitzpatrick colors. He’s got a life, a family. Little Ben. Beautiful Rachel. But he needs the drugs to keep it all together. And he’s having trouble getting the drugs today. Ben’s talent show is tonight, and he’s upset that his friends were ignoring him today. Rachel, too – she tells him how she failed to get someone’s attention earlier that day. That night, just as Ben goes on stage, it all falls apart, and they finally catch up with Neverboy. Turning ideas upside down is a common trope, but it’s rare to see a story effectively turn fantasy itself upside down. Even after reading it a few times, I’m still not sure which part of this story is real and which is fantasy. I’m not even sure Neverboy knows at this point. But it’s beautifully done, both in the writing and in the art, blurring the lines just enough to keep the reader off balance. I really think this is a book to watch. There’s some really cool and possibly important stuff going on here. Pick it up and see for yourself. 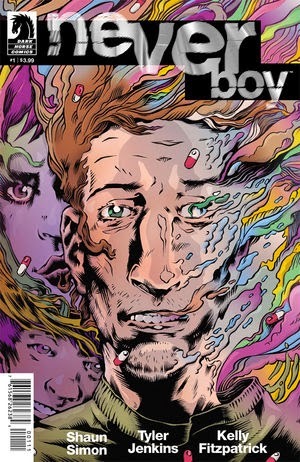 NEVERBOY #1 is available now at your FLCS or at darkhorse.com.